This article is about the traditional winter holiday song. For the song by Crazy Frog, see Jingle Bells/U Can't Touch This. For the musical instrument, see Jingle bell. For the comics character, see Jingle Belle. originally known as "One Horse Open Sleigh"
Although originally intended for the Thanksgiving season, and having no connection to Christmas, it became associated with Christmas music and the holiday season in general decades after it was first performed by blackface minstrel performer Johnny Pell in Ordway Hall in Boston in September 1857. Some area choirs adopted it as part of their repertoire in the 1860s and 1870s, and it was featured in a variety of parlor song and college anthologies in the 1880s. It was first recorded in 1889 on an Edison cylinder. It is an unsettled question where and when Pierpont originally composed the song that would become known as "Jingle Bells". A plaque at 19 High Street in the center of Medford Square in Medford, Massachusetts, commemorates the "birthplace" of "Jingle Bells", and claims that Pierpont wrote the song there in 1850, at what was then the Simpson Tavern. According to the Medford Historical Society, the song was inspired by the town's popular sleigh races during the 19th century. "Jingle Bells" was originally copyrighted with the name "One Horse Open Sleigh" on September 16, 1857. Mrs. Otis Waterman, one of Pierpoint's friends, described the song as a "merry little jingle", which became part of its new name when published in 1859 under the revised title of "Jingle Bells, or the One Horse Open Sleigh". The song has since passed into the public domain. The date of the song's copyright casts some doubt on the theory that Pierpont wrote the song in Medford, since by that date he was the organist and music director of the Unitarian Church in Savannah, Georgia, where his brother, Rev. John Pierpont Jr., was employed. In August of the same year, James Pierpont married the daughter of the mayor of Savannah. He stayed on in the city even after the church closed due to its abolitionist leanings. "Jingle Bells" was often used as a drinking song at parties: people would jingle the ice in their glasses as they sang. The double-meaning of "upsot" was thought humorous, and a sleigh ride gave an unescorted couple a rare chance to be together, unchaperoned, in distant woods or fields, with all the opportunities that afforded. Music historian James Fuld notes that "the word jingle in the title and opening phrase is apparently an imperative verb." In the winter in New England in pre-automobile days, it was common to adorn horses' harnesses with straps bearing bells as a way to avoid collisions at blind intersections, since a horse-drawn sleigh in snow makes almost no noise. The rhythm of the tune mimics that of a trotting horse's bells. However, "jingle bells" is commonly taken to mean a certain kind of bell. ^ "Upsot" is an alternative poetic version of "upset". ^ Two forty refers to a mile in two minutes and forty seconds at the trot, or 22.5 miles per hour. This is a good speed, and suggests the horse should be a Standardbred. The two first stanzas and chorus of the original 1857 lyrics differed slightly from those we know today. It is unknown who replaced the words with those of the modern version. The original 1857 "Jingle Bells" had a slightly different chorus featuring a more classical-style melody. The "I V vi iii IV I V I" chord progression is a common theme in classical music; except for the final two chord changes, the melody as originally written follows the same chord progression as Pachelbel's Canon; the tune would later become more closely associated with another Christmas song, "Jolly Old Saint Nicholas", which appeared about twenty years after "Jingle Bells". The "Jingle Bells" tune is used in French and German songs, although the lyrics are unrelated to the English lyrics. Both songs celebrate winter fun, as in the English version. The French song, titled "Vive le vent" ("Long Live the Wind"), was written by Francis Blanche and contains references to Father Time, Baby New Year, and New Year's Day. There are several German versions of "Jingle Bells", including Roy Black's "Ein kleiner weißer Schneemann". The Swedish version titled "Bjällerklang" (Bell Clang) contains a few extra lines, eight bars long, in the chorus which are followed by a repetition of the last two lines of the chorus. Those were added by the Swedish lyricists, Eric Sandström [sv] and Gösta Westerberg [sv]. See also: List of artists who have recorded "Jingle Bells"
James Lord Pierpont's 1857 composition "Jingle Bells" became one of the most performed and most recognizable secular holiday songs ever written, not only in the United States, but around the world. In recognition of this achievement, James Lord Pierpont was voted into the Songwriters Hall of Fame. "Jingle Bells" was first recorded by Will Lyle on October 30, 1889 on an Edison cylinder however no surviving copies are known. The earliest surviving recording was made by the Edison Male Quartette in 1898, also on an Edison cylinder as part of a Christmas medley titled "Sleigh Ride Party". In 1902, the Hayden Quartet recorded "Jingle Bells". The song became a Christmas favorite in the early twentieth century. In 1943, Bing Crosby and the Andrews Sisters recorded "Jingle Bells" as Decca 23281 which reached No. 19 on the charts and sold over a million copies. In 1941, Glenn Miller and His Orchestra with Tex Beneke, Marion Hutton, Ernie Caceres, and the Modernaires on vocals had a No. 5 hit with "Jingle Bells" on RCA Victor, as Bluebird 11353. In 1935, Benny Goodman and His Orchestra reached No. 18 on the charts with their recording of "Jingle Bells". In 1951, Les Paul had a No. 10 hit with a multi-tracked version on guitar. In 2006, Kimberley Locke had a No. 1 hit on the Billboard Adult Contemporary chart with a recording of the song. "Jingle Bells" has been performed and recorded by a wide variety of musical artists, including Louis Armstrong, The Beatles, The Chipmunks, Judy Collins, Nat King Cole (also using the melody at the end of his hit song "The Christmas Song"), Perry Como, Plácido Domingo, Duke Ellington, Ella Fitzgerald, Jo Stafford, Spike Jones, Barry Manilow, the Million Dollar Quartet (Johnny Cash, Jerry Lee Lewis, Carl Perkins, and Elvis Presley), NSync, Luciano Pavarotti, Laura Pausini, Smokey Robinson and the Miracles, Frank Sinatra, Gwen Stefani, Barbra Streisand, Fats Waller, and Yello, among many others. In 1955, Don Charles, from Copenhagen, Denmark, recorded a novelty version with dogs barking to the melody of "Jingle Bells" as RCA 6344, and a version credited simply to "St. Nick" called "Jingle Bells (Laughing All the Way)" features someone laughing, rather than singing, the entire song. Gemini VII, this is Gemini VI. We have an object, looks like a satellite going from north to south, up in a polar orbit. He's in a very low trajectory traveling from north to south and has a very high climbing ratio. It looks like it might even be a ... Very low. Looks like he might be going to reenter soon. Stand by one ... You might just let me try to pick up that thing. The astronauts then produced a smuggled harmonica and sleigh bells and broadcast a rendition of "Jingle Bells". The harmonica, shown to the press upon their return, was a Hohner "Little Lady", a tiny harmonica approximately one inch (2.5 cm) long, by 3/8 of an inch (1 cm) wide. Like many simple, catchy, and popular melodies, "Jingle Bells" is often the subject of parody. "Jingle Bells, Batman Smells" has been a well-known parody since the mid-1960s, with many variations on the lyrics. Bart Simpson sings this version on The Simpsons, the first time being on "Simpsons Roasting on an Open Fire" (December 1989). The Joker himself also sings it in the Batman: The Animated Series episode "Christmas With the Joker" right before he "got away". These lyrics were included in the 2013 film Prisoners starring Hugh Jackman; also Mike Nelson, Tom Servo, and Crow sang those lyrics over the opening credits of Santa Claus in episode #521 of Mystery Science Theater 3000. Comedian Phil Snyder recorded a full-length version of the song, adding new verses utilising other comic superheroes. This same parody was also done in an episode of SpongeBob SquarePants with the lyrics being changed to refer to the characters Mermaid Man and Barnacle Boy. Parodies or novelty versions of "Jingle Bells" have been recorded by many artists, and include Yogi Yorgesson's "Yingle Bells", Da Yoopers' "Rusty Chevrolet", Bucko and Champs' "Aussie Jingle Bells", The Three Stooges' "Jingle Bell Drag", and Jeff Dunham's "Jingle Bombs", performed in his "Achmed the Dead Terrorist" sketch. Another popular spoof of the song is "Pumpkin Bells", a "Pumpkin Carol" which celebrates Halloween and the "Great Pumpkin". It originated in The Peanuts Book of Pumpkin Carols, a booklet based on the "Peanuts" comic strip and published by Hallmark Cards in the 1960s. Other verses add further details about what happens when the Ute arrives at the family Christmas. Musical notation for the chorus of "Jingle Bells"
"Jingle Bell Rock" by Bobby Helms pays homage to "Jingle Bells", directly referencing the source song's lyrics, but with a different melody. Originally recorded and released by Helms in a rockabilly style, "Jingle Bell Rock" has itself since become a Christmas standard. In the Brian Setzer Orchestra version of the song, the first occurrence of "one-horse open sleigh" in the chorus is changed to "'57 Chevrolet", most likely to better suit the band's throwback rock 'n' roll/big band style. The first notes in the chorus have become a motif that has been inserted into recordings other Christmas songs, most notably a guitar passage at the end of Nat King Cole's "The Christmas Song" and Clarence Clemons performing a saxophone solo in the middle of Bruce Springsteen's "Merry Christmas Baby"; a piano is also heard playing these notes at the end of Springsteen's version of "Santa Claus is Coming to Town". A slow version of the chorus opening forms the conclusion of Stan Freberg's 1957 "Green Chri$tma$", interspersed with cash-register noises. Mariah Carey utilizes a bit of the melody in her song "When Christmas Comes". The Tijuana Brass version of "America", which is not a Christmas song, nonetheless begins with the first few notes of "Jingle Bells". This song was sung as "Dingillerrr" ("The prick" in Turkish slang) by Grup Vitamin in 2015 album, Endoplazmik Retikulum, for satirizing such as consequences of Istanbul's enormous growth; Turks gradually get the jitters; and deforestation of Turkish cities. In 2010 the Israeli satirical website Latma produced a parody titled "Jihad Bells", where the Palestinian Minister of Uncontrollable Rage explains the persecution of Christians in the Muslim world. ^ a b "A Thanksgiving Carol". snopes.com. December 18, 2014. Retrieved December 23, 2014. ^ Doyle, Steven (September 16, 2017). "This day in history: Sept. 16, 1857". Greensboro News & Record. Retrieved September 16, 2017. ^ a b c Brown, Joel (December 8, 2016). "History of Jingle Bells". BU Today. Retrieved February 3, 2019. ^ Wilcox, Kris (December 15, 2014). 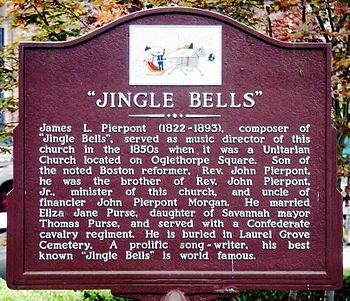 "James Lord Pierpont and the mystery of 'Jingle Bells'". UU World. Retrieved September 23, 2016. ^ Pierpont, J. (September 16, 1857). "One Horse Open Sleigh". Boston: Oliver Ditson & Co. Retrieved December 26, 2006. ^ Frederick, Kym (December 6, 2014). "Jingle Bells – James Lord Pierpont". NewportCityRadio.org. Retrieved December 16, 2017. ^ Loboy, Jim (November 30, 2017). "Nugget of Knowledge: Jingle Bells a drinking song?". WYTV.com. Nexstar Broadcasting. Retrieved December 16, 2017. ^ "Vive le vent (French chorus and literal English translation)". About.com. Retrieved December 26, 2006. ^ "Vive le vent (with verses and augmented refrain)". Paroles.net. Retrieved December 26, 2006. ^ "Roy Black's version of "Jingle Bells in German" (German lyrics and literal English translation)". About.com. Retrieved December 26, 2006. ^ "A Bing Crosby Discography". BING magazine. International Club Crosby. Retrieved December 30, 2017. ^ Whitburn, Joel (1986). Joel Whitburn's Pop Memories 1890–1954. Wisconsin, USA: Record Research Inc. p. 113. ISBN 0-89820-083-0. ^ a b Edwards, Owen (December 2005) "The Day Two Astronauts Said They Saw a UFO Wearing a Red Suit" Smithsonian Magazine. p. 25. ^ Studwell, William Emmett (1994). The Popular Song Reader: A Sampler of Well-Known Twentieth Century-Songs. Routledge. p. 224. ISBN 1560230290. ^ Bronner, Simon J. (1988). American Children's Folklore. August House. p. 105. ^ Groening, Matt (2001). The Simpsons season 1 DVD commentary for the episode 'Simpsons Roasting on an Open Fire' (DVD). 20th Century Fox. ^ Lind, Stephen (2015). A Charlie Brown Religion. University Press of Mississippi. p. 222. ISBN 978-1-4968-0468-6. ^ Collins, Ace (2010). Stories Behind the Greatest Hits of Christmas. Zondervan. pp. 101–103. ^ "Herb Alpert's Tijuana Brass – America". YouTube. February 6, 2010. Retrieved December 30, 2016. ^ "Grup Vitamin – Dingiller Şarkı Sözü". alternatifim.com. Retrieved September 23, 2016. Wikimedia Commons has media related to Jingle Bells (song). Complete lyrics and further details to "Jingle Bells"